China's one-child policy, which was created as a measure to find the ever growing population, has backfired has created a serious gender imbalance. Even though the one-child policy has since been abandoned, with couples allowed two children now, the former policy has still made its dent. 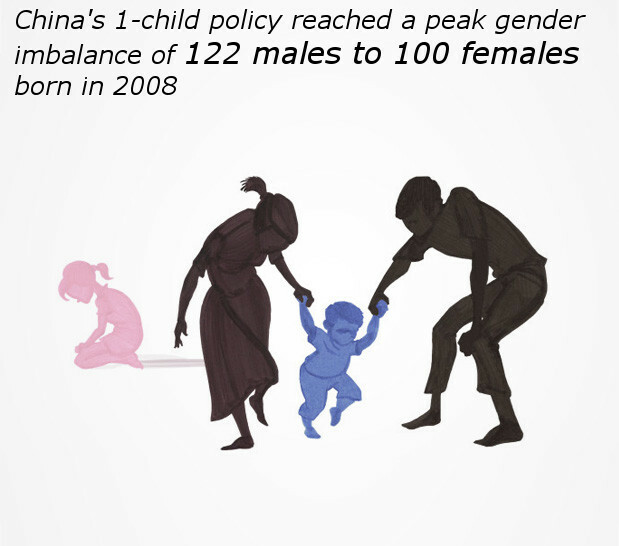 Many parts of China prefer male children and sometimes take drastic measures in ensuring they have a male child. This has caused a gender imbalance of 122 males to 100 females born in 2008 and it is estimated that by 2020 there will be 30 million more males have marrying age than females. This type of huge gender imbalance will have negative impact many men as it will make finding a partner more difficult. For more information about the impact of this huge gender imbalance, make sure to check the source below. Subscribe for Daily Interesting Facts!